Why Should Every Canadian Remember? On Remembrance Day, which falls on November 11th, we in Canada take a moment to pause and to remember all of those who served Canada. We stand and we honour those who fought during The Great War 1914-1921, World War 2 during 1939-1946, the Korean War of 1950-1953, and the War in Afghanistan from 2002-2014. More than 1 ½ million Canadians stood up to serve their country and 113, 050 paid the supreme sacrifice never again to return home to Canada and to their loved ones. Those Canadians gave their lives along with their futures so that all of us would have the opportunity to live in Peace, Democracy and Freedom. We must always remember, for if we do not, the sacrifice made by many will be meaningless. These men and women died for each of us; for their homes; for their families and friends; for a collection of traditions that they all cherished and for a future that they all believed in. They died for Canada. The meaning of what it was they sacrificed now rests with our collective national consciousness and the result is that our futures are their monument. Who Is It We Remember? As our men and women from Huron County departed for overseas, traffic stopped; people watched from the sidewalks and from the windows. Some stood in silence while others stood, watched and wept. Some cheered or called out the name of a person in uniform that they knew – an officer who for years had served part time in the militia, to a gentle giant from a farm in the county, to a man with a police record and to a young man leaving Huron County and his home and leaving behind the prettiest girl. We must always remember the human face of war. The loss of comrades; living conditions that were brutal and extreme; intense training; physical hardships; spiritual hardships along with fear illuminates what a soldier, airman and sailor experienced in battle. On Remembrance Day and other days during the year, the opportunity is given to us to remember the efforts of these special Canadians. During these days we are paying homage to all those who stood up and responded to the needs of their country. The two minutes of silence provide us with another opportunity of remembering wartime, while at the same time providing us with the opportunity to think of ways to strive for peace. 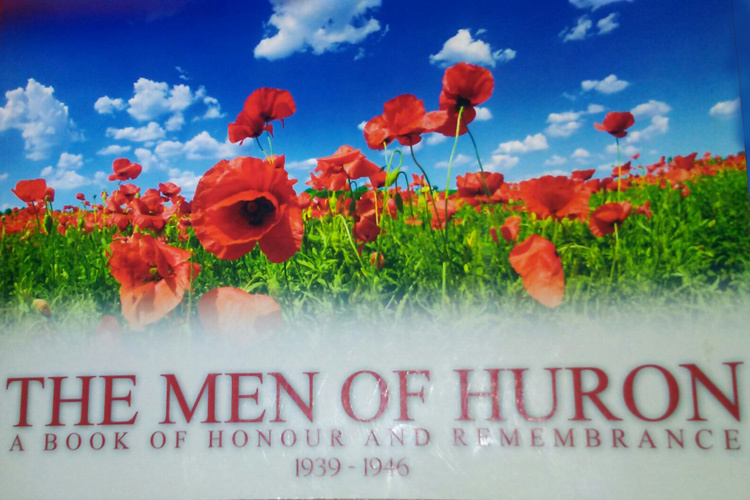 As we pause, we bow our heads and remember all the brave young men and women from Huron County and the other counties of Canada who courageously volunteered for the cause of freedom and peace around the globe. All fought to preserve our traditions along with our way of life; our values and all of the freedoms we enjoy today. Many times, much of that is taken for granted. The silence is to honour their sacrifice and their memory. During any conflict that Canada has ever been involved in, the young men and women of Canada have stood up with a blank cheque in hand payable to Canada and in the amount of up to and including the life of that person.